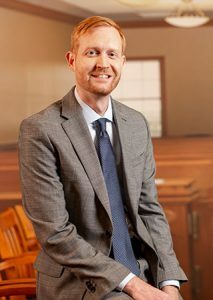 Brian A. Williams joined the Oklahoma City Carr & Carr office in May of 2017. Previously, he spent 11 years representing Oklahomans as a personal injury attorney in federal, state and workers’ compensation courts. Brian has spent his entire career focused on cases involving Social Security, wrongful death, slips and falls, car accidents and on-the-job injuries. With more than 1,000 cases resolved, resulting in millions of dollars of settlements, Brian is not afraid to stand up to insurance companies and corporations. His favorite part of his job is advocating for his clients. Born in Oklahoma City, Brian was raised in Dallas, but that has never stopped him from cheering for the Sooners. Brian lives in Oklahoma City with his wife, Carrie, who serves as executive director of Rainbow Fleet. Brian and Carrie have two young sons, Noah and Benjamin. When not answering the endless questions of two small boys, the family spends its time on the golf course and cheering for the Thunder.